Dow Honda | 2016 Honda Vehicles | What’s the difference between the 2016 and 2017 Accord? What’s the difference between the 2016 and 2017 Accord? With the recent release of the 2017 Accord, many car buyers are wondering what makes it different than the 2016 model? Aesthetically, the 2016 and 2017 Accord models are very similar. They feature a similar metalwork and interior design. Both years come with two engine options; a 2.4L, 16-value, Direct Injection DOHC, i-VTEC, 4-cylinder engine and a 3.5L, 24-valve, SOHC, i-VTEC, V6 engine. They also both come with a 6-speed manual transmission or Continuously Variable Transmission. Shared tech options include the Honda Sensing bundle of safety features, LaneWatch Blindspot Display, a multi-angle rearview camera, Display Audio System with Honda Satellite-Linked Navigation System, Bluetooth HandsFree Link, two USB connectors, and WiFi tethering. For entertainment, both the 2016 and 2017 Accord models feature Apple CarPlay, Android Auto, and HondaLink the Next Generation. Both years can also easily create more interior space, with their folding Magic Seats. 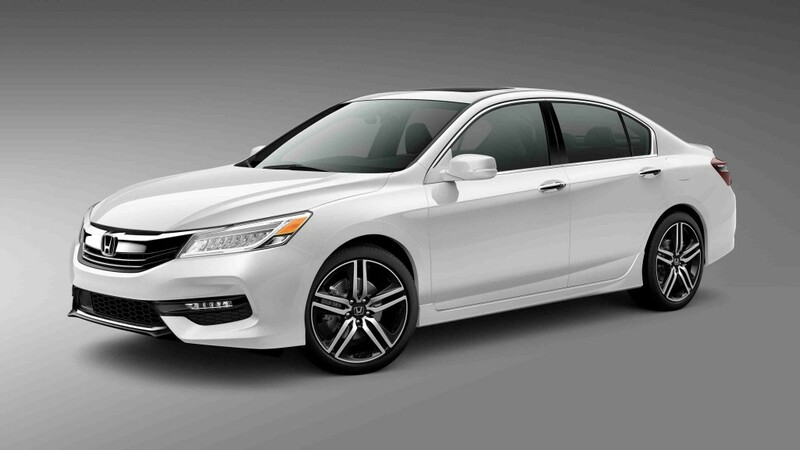 The 2016 Accord comes in seven trim levels; LX, Sport, EX-L, EX-L V6, Touring, and Touring V6. Paint colours include Crystal Black Pearl, Lunar Silver Metallic, White Orchid Pearl, Obsidian Blue Pearl, Modern Steel Metallic, and Basque Red Pearl II. It features three interior fabric options; black leather, grey fabric, and a black combination of leather and fabric. The 2017 Accord comes in eight trim levels; LX, SE, Sport, Sport – Honda Sensing, EX-L, EX-L V6, Touring, and Touring V6. Paint options include Lunar Silver Metallic, Crystal Black Pearl, White Orchid Pearl, San Marino Red, Obsidian Blue Pearl, Modern Steel Metallic, and Basque Red Pearl II. The interior fabric options remain the same as the 2016 Accord, only with the addition of grey leather. New tech features include wireless charging and Bluetooth Streaming Audio. The 2017 Accord also features optional heated rear seats. If you would like to see pictures of the 2017 Accord in the Dow Honda Showroom, click here! Click here to learn about the 2016 Accord’s ratings history, and click here to see its list of awards! If you would like to take a Honda Accord for a test drive, click here! If you have any questions about the 2016 or 2017 Accord models, click here to contact us!